MapBrowser is an integrated maps system developed by Rainer Kosbi as an alternative to his SVG maps system. MapBrowser will run in the majority of browsers using Adobe's Flash Player on Windows and Apple Mac personal computers and can be used to easily access our online maps. This first option gives access to some pre-prepared scenarios. This option opens and closes the Search/Overview window. Use this window to find and mark locations like Towns, Townslands or Monuments on maps (where available), to see the current display's position and to move its focus to a different location.The Search/Overview window shows the whole county with a red circle marking the location of the area shown in the main window. This enables you to switch to a combination of the Standard Arrow and Pan Cursor – the context will decide which one will be active. This is also the default cursor in MapBrowser. This enables you to switch from the Pan Cursor below to select the Standard Arrow Cursor - necessary to highlight a feature on a map. Use this option to activate the Standard Arrow Cursor to select map symbols. This enables the Pan Cursor, allowing you to move around a map. Use this option to activate the Pan Cursor to drag and drop the map display. This enables zoom-in of a selected area on a map. Use this option to activate the Zoom-In Cursor to zoom-in (and centre) on a spot or to describe a zoom-in area with an rectangle. This enables zoom-out on a map. Use this option to activate the Zoom-Out Cursor to zoom-out (and centre) on a spot. This opens and closes the maps Directory window which will show you the complete collection of maps in the system. 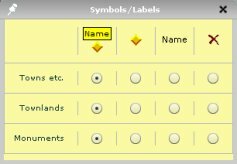 This opens the Symbols & Labels window, allowing control over display of symbols on the maps. This opens the Map Legend window (where applicable). This opens the Print window, allowing printing of the current map display, including automatic rotation and down-scaling (when nessary). This toggles the zoom slider on and off. This is the zoom slider, enabling easy zoom-in and zoom-out on maps. If enabled, clicking the round button on the top of the slider allows you to fit the whole of the current map into your window.